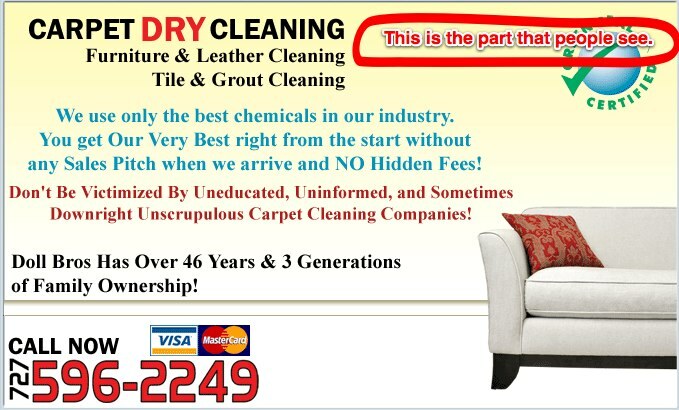 This Tampa Bay, FL based carpet dry cleaning company, on the strength of their 50Â year reputation combined with listings on popular websites such as BBBonline.org and Angie’s List , was doing good in many respects. Except one. 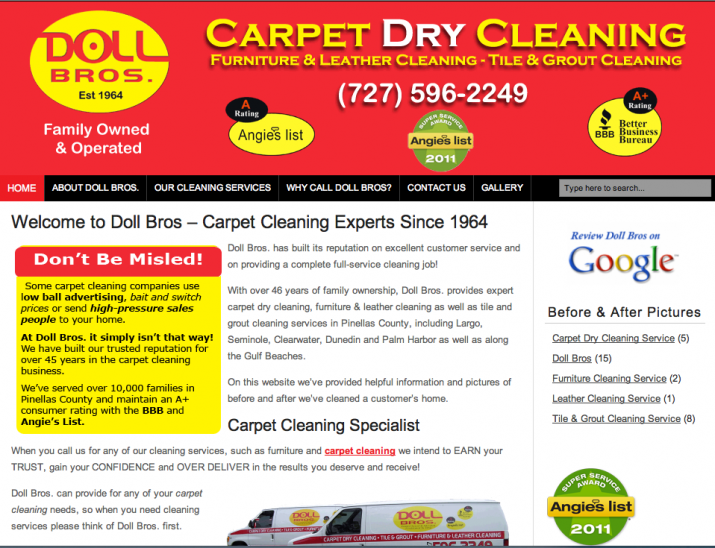 In 2012, if you were looking for Doll Bros Carpet Dry Cleaning on Google and they simply could not be found. They needed local business online marketing services and the help it would provide. Usually when a site is completely invisible in search results, it’sÂ because of the way their website is built or hosted, so that’s where I started looking at their problem. Let’s take a look at what Google sees. 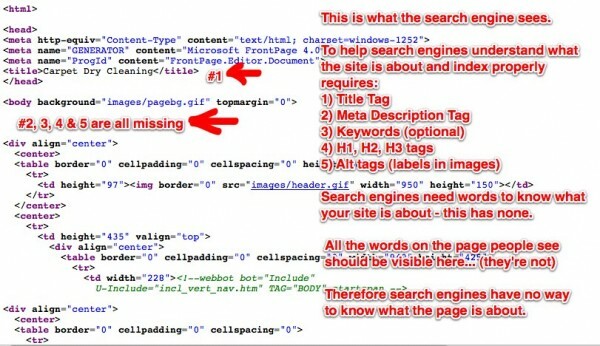 By the way… if you want to take a second to ‘see’ what Google see’s on your site, just pull up your site on your computer, then with your mouse pointed somewhere along the outer edge of the back, or in the background area, right click on the page. Then scroll down the list of options and you’ll see ‘view source’, just click on that and you’ll see something that looks identical to the picture above. Check the notes in red against the data that Google sees on your page and you may learn of something in your online marketing effort that needed to be addressed. The Client’s Goal – Increased Leads and Sales! The easiest way to fix the issues with his website, while improving his chances of attracting business from local business online marketing was to build a new site, from the ground up. The project needed to address the part that Google sees as described above, while also turning the site from an electronic brochure to a powerful marketing site. The best way to do that is to incorporate the things that Google LOVES into your site including pictures, videos and other forms of content. This is the essence of content marketing. Transitioning from interrupting prospective customers to helping future customers to know, like and trust your business. Considering that people use the internet to learn things BEFORE they ever think of who they want to do business with, content marketing gives your business a leg up with consumers because you provide them a rich source of information from your website. While they’re consuming content on your website, you’ll being elevated into the top local company, in their mind. Their new site Â presents this business as a leader in their industry. The yellow box on top left emphasizes top results on the rating sites and that they’ve served over 10,000 families. But now we’ve also incorporated a blog, in the form of a series of before-after images. Those before and after images are surrounded by links to the top review sites which just screams credibility. Awards like winning the Angie’s List Super Service Award helps as well. This image pretty clearly shows the improvements in his results. In the first year, he generated over 110 leads mostly because he’s been creating and distributing content that his ideal consumer uses in evaluating a local business, including pictures and reviews. A prominent part of every post is a clear call-to-action – asking people to request a no-obligation quote for having their carpets cleaned using their unique process. The long-term impact of local business online marketingÂ is cumulative, meaning that every article, every post and every picture you put out makes it easier for prospects to find your business online.Â Because of this positioning, his growth potential is basically unlimited. Let’s look at the 2nd year of results. Â Average leads per month is up, conversion rate is up. And these numbers do not include all the people who’s response is to call on the phone. Is their investment inÂ local business online marketing services producing an ROI? This image shows that his marketing campaigns is bearing fruit. Over 270Â leads in under 24 months and a solid 6.25% conversion rate of visitor to lead. Most businesses are delighted with a conversion of of visitor to lead of 2-3%. Doll Bros reports that 80% of these inquiries became new customers. The other ‘hidden’ stat is that because they are so busy, they’ve raised the minimum service charge from $97 to $147. His return on investment is hugely profitable and growing by the month. Wondering if your business can produce eye-popping results like this? Let’s talk about it in a no-obligation strategy session. If what we do is right for your business marketing needs, we’ll both know. Just connect with me here and lets talk about your business goals.